The largest sedan in Chevy's lineup, the 2019 Impala is comfortable, roomy, well-equipped and fuel-efficient. Rivaling what many SUVs offer, there's enough cargo space for a long trip, and plenty of upscale features, including onboard Wi-Fi. The pricing is one thing that's smaller than you might expect, making it an affordable alternative to competitors like the Toyota Avalon, Nissan Maxima and Ford Taurus. This car is extremely safe. I have no issues with this vehicle. I absolutely love it. Very comfortable and great performance. Super user friendly and extremely safe. I could honestly say every household should own this car. All of the safety features. I like all of the safety features offered. I like how it informs me on when my oil needs changed. I do not like how it takes forever for the ac to kick in. This car is super easy to drive any very user friendly. The 2019 Chevy Impala is a very outstanding vehicle. Extremely comfortable and very good on gas. I would not choose any other vehicle. 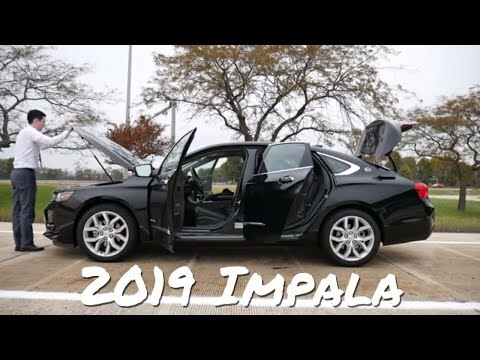 Trent Shows You The 2019 Impala Premier! !